1: La Coulicam. 2 La Laborde 3: La Poplinere. 4 : Las Pantomine. 5 La Forquerary. 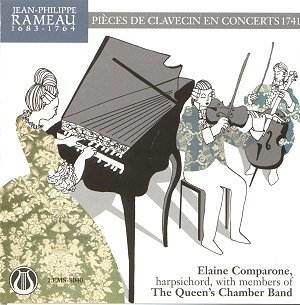 Elaine Comparone (harpsichord) Queens Chamber Band. As I am known for my love of modem " classic" music I surprised a University class when they asked me whom I thought the greatest opera composer was. Gasps went up throughout the lecture hall. I still stick to that view. To me he is the very greatest of the early composers. He music has style, life and coherence. But how badly it is invariably played. This disc is truly delightful. The first concert starts with great attack particularly the cellist, Peter Seidenberg. the oboist, Marsha Heller, is supremely articulate and the harpsichordist, Elaine Comparone, a little distant at times, adds to the strong vigour of a really dynamic performance. Oh, how I hate early music played in that effeminate way as if you were comforting a baby. Prissy baroque performances are loathsome and here is evidence of how to play this music with fire and life. And the result is so good you cannot justify the affected ghastly performances that have hitherto been all the rage. The intimacy of the slow movement is so real that you experience it. This music and the performance communicates at once and leaves a lasting impression. Some music is taught and some music is caught . Some music and performances are beyind the feeble efforts of praise. The second concert is for flute, violin and harpsichord and the opening movement has a infectious swagger to it and a joy about it. The skill and counterpoint is flawless. And, in the nicest sense, this is foot-tapping music. And to think that this music was modem when it was written! When his music is played as well as this you will see what it contains.., which ingredient is not in those effeminate and so authentically correct performances. What is here is passion, real passion, unbridled and convincing. I could go on and on but enough has been said. This disc is a rare winner. You will not hear Rameau played better. This disc is a touchstone . It has set such an incredibly high standard that I cannot see how it will ever be equalled let alone excelled. It is also the definitive example of how early music should be played. Now I must go and lie down!